University House was opened on 16 February, 1954, by His Royal Highness the Duke of Edinburgh, as the first building on the campus of the newly-formed Australian National University. It was home to all of the research students and professors of the University at the time. Very much styled on the colleges of Oxford and Cambridge it was, for a time, referred to as “Oxbridge in the Bush”. The complete history of the first 50 years of University House is documented in Jill Waterhouse’s engaging book, University House, As They Experienced It: A History 1954-2004. Copies are available at University House reception. An ancient Greek banded cup appears on the logo of University House and is used throughout our promotional materials. It dates from 600BC and was acquired by the first Master, Professor A.D. Trendall on his travels in Europe. It was formally presented to the House by Dr Germaine Joplin who, at the time, was Steward of the House. Located in the foyer of the Great Hall are four stunning tapestries that celebrate the work of several award-winning ANU academics. The Jubilee tapestries were commissioned as a gift by the University to University House on its 50th anniversary and were the creation of Valerie Kirk, Head of Textiles at ANU. The Eccles tapestry celebrates the work of Sir John Eccles who won a Nobel prize for his accomplishments in neurophysiology: The foreground depicts, in black, a motoneuron with a micro electrode; the coloured background is based on a digital image of the spinal interneuron injected with the fluorescent “lucifer yellow” dye. The Florey tapestry celebrates the work of Lord Howard Florey for his Nobel prize associated with the University for his work on antibiotics and depicts the action of Penicillin on a petri dish. The third tapestry celebrates the work of Peter Doherty and Rolf Zinkernagel for their Nobel award winning discoveries concerning the specificity of the cell mediated immune defence and depicts a lymphocyte invasion of virus growth sites. The fourth tapestry was commissioned by the University in 2006. It celebrates the Japan prize awarded to Professor Frank Fenner for his significant work in the eradication of smallpox and shows a bifurcated needle applying the vaccine to an electron mircrograph of a variola virus isolated from a specimen from the last known case of smallpox in the world. The Fifth tapestry… It celebrates the Nobel Prize Awarded to Professor Brian Schmidt for his role in the discovery of the accelerating expansion of the Universe through observations of distant supernovae. 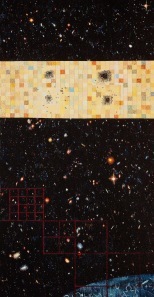 The tapestry shows a distant part of the Universe, overlaid with the discovery images of his team’s first distant supernova. For more of the history and events surrounding University House, copies of “University House As They Experienced it” is available for sale at reception.